So you want to know the secret to getting an “A” in Organic chemistry? Let me tell you the fail-proof method of conquering what many deem the most difficult class in undergraduate studies. Not the answer you were expecting? I mean there’s got to be an easier way, right? Well sorry to disappoint you, but the only way you will see that “A” on your transcript next to Organic chemistry is by good old fashion studying. Of course just telling students to study is easier said than done. Organic chemistry is not something that most of us can inherently pick up and understand. Let me elaborate a little on this simple word, studying. Here at StudyOrgo.com we teach a proven method that has our students scoring in the top of their class, however they still take the time to learn and comprehend the material a by studying. We give them the secret sauce though, making it easier and their study time more efficient. Organic chemistry is a lot of information. Probably more information than most students have been required to know for any class up to this point. It is not enough to just try to memorize all the reactions, names, and concepts. Many students who have tried this method end up not doing as well as they’d like. You cannot memorize Organic chemistry, you must understand the information, which you can accomplish with rigorous studying. As a student, you must have a strong understanding of some very fundamental chemical phenomena. We make this easy using our Summary Guides that we call “Benny’s Notes”. Just to name a few of the most repeating concepts in Organic chemistry, you must understand what acids and bases do (which protonates and which depronates? ), which elements are electronegative, what are partial charges and dipoles, and one of the most important concepts, how an atoms electrons interact with a chemical system. If you understand and have these ideas down, you will have no problems doing your first reaction mechanism. Much of your studying will consist of doing a handful of reactions over and over again until you completely understand them. Our online organic chemistry flashcard system will have you understanding the reactions backwards and forwards in no time. We have an iPhone app too that makes studying on the go even easier. At that point, it will not be memorization though, it will be complete understanding. You will become familiar with why certain atoms behave the way they do, and often times atoms behave the same way in many reactions, so there is overlapping information. This is the secret to studying Organic chemistry, you must understand the reactions, do not try to memorize them! You are now an enlightened individual and have the key to success in Organic chemistry. Now let’s talk a little bit about how you should study and what tools you can use to help. After every lecture, it is pertinent that you review your notes before the next lecture. The information will become much easier to digest in smaller bits than waiting until 4 lectures have passed to review the information. Your notes will highlight the main ideas that you as a student are responsible to know. Go over them, practice them, do not stop until you understand the information. If something does not make sense, find something to use as a reference. Here at StudyOrgo.com, we highlight and cover the main reactions that first semester Organic chemistry students MUST know for their exams. 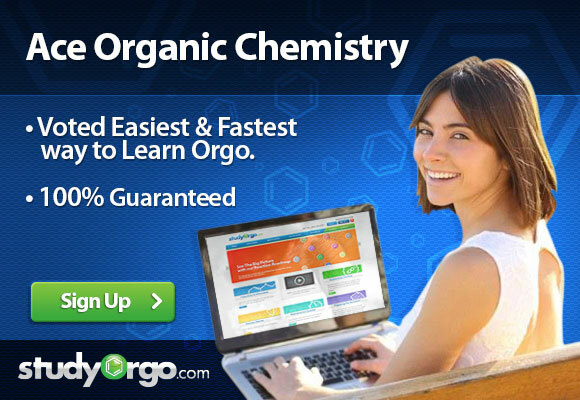 StudyOrgo.com will be your best friend when studying. Not sure how to how to form an alcohol or what product is formed if you oxidize an alcohol? StudyOrgo.com has you covered. Under the “What’s Covered” tab, you will find a list of all of the topics and reactions that our program covers. We can help you learn the material from scratch or just simply use us as a source of practice problems for everything your professor is likely to cover in class, giving you an upper hand. So there you have it ladies and gentlemen, that is the secret to scoring an “A” in Organic chemistry. So what are you waiting for, shouldn’t you be studying? Get started today and take 10% off if you sign up today using coupon code “acespring”. We offer a 100% Guarantee to pass!